I have quite an eclectic music collection, which grew considerably last year when I spent quite a bit of time in Tokyo. My favourite Sunday afternoon haunt was HMV @ Times Square, checking out the Shunjuku South indie chart. A suitcase of CDs later, I finally got around to ripping my entire CD collection and adding it my old ripped vinyl collection. All nicely organised, named and categorised in iTunes. 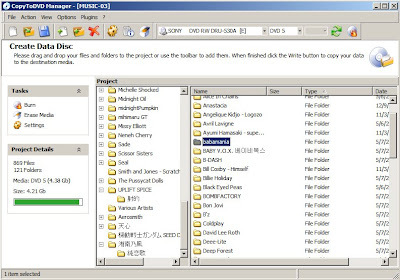 Feeling very pleased with myself, I wanted to archive all my hard work onto a set of DVDs, only to find that my (Windows-based) recording software baulked at the Japanese, Korean and Chinese characters in the folder and filenames. My first thought .. should just need to change the file system format? But it didn't take long to discover it wasn't so simple. In fact, of the half a dozen different disk burning softwares I ended up trying out (including most of the "major" names), all but one failed to handle my babel of disks correctly. So I'd like to spread the word. VSO CopyToDVD was the ONLY product that worked. It costs a few bucks to buy, but I just downloaded the limited-time trial and it passed the unicode test with flying colours. I didn't really poke around all its features, but it seems to pack the lot. And the fact that I could download it and bang out a few DVDs in short order pretty much sums things up. I'll be buying it, and if you also need to burn disks with unicode file/folder names then I can recommend you check it out too.